The hard work and client dedication at Kelleher & Buckley, LLC does not go unnoticed. We proudly announce the selection of five of our attorneys as Illinois Super Lawyers and Rising Stars for 2019! 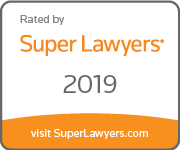 Super Lawyers rates outstanding lawyers from more than 70 practice areas who have attained a high-degree of peer recognition and professional achievement. Every year, Super Lawyers evaluates lawyers across the country for its annual list of top attorneys. This selection process includes independent research, peer nominations and peer evaluation. Only five percent of the total lawyers in the state are selected as Super Lawyers and no more than 2.5 percent are named Rising Stars.